In India, people use Facebook for keeping in touch with family, sharing photos and finding blood. Facebook is launching a new tool in India on Oct. 1 to help match blood donors with hospitals, blood banks and individuals in need. There is a shortage of blood in India. The amount varies between states and cities, but overall the country has 10% less donated blood than it needs. It has created a situation in which patients and their families are often responsible for replenishing the blood banks' supply. To pay off the blood debt, people post requests on social media, including on Facebook. The new Facebook tool will prompt users on Android and the web to sign up as eligible donors. It will ask for their blood group (also known as blood type) and if they've donated before. The information is all private by default, but a person can choose to share it in the news feed to spread awareness. "Our teams have identified a real need in India," said Hema Budaraju, a Facebook product manager for South Asia. "People are using Facebook literally thousands of times a week to look for blood donors." When Budaraju's father was being treated for cancer five years ago, he needed daily platelet transfusions. His family members had to call friends and family to ask for help. Now the process happens online. In groups like "Maduri blood donors" and "Raktha daana jeeva daana," people post requests for blood donors. Most follow a simple format: Name, health issue, blood group, amount needed, hospital and a contact number. "They're already doing this in an unstructured way," Budaraju said. With 201 million active users in India, the tool has the potential to make a dent in the shortage. 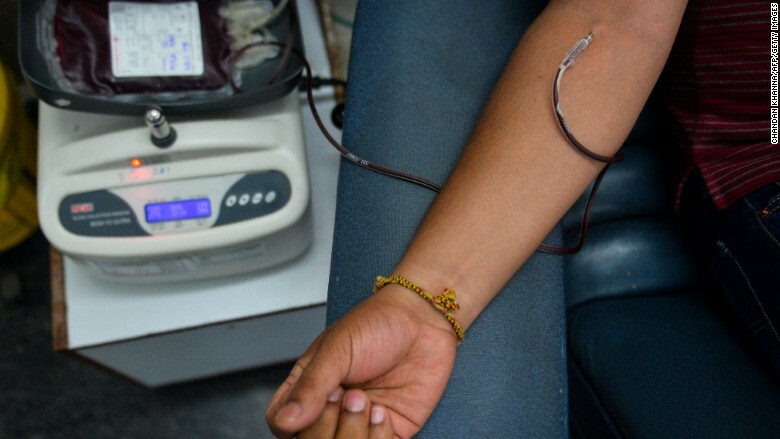 The lack of blood is caused by widespread myths about the process, and a 1995 ban on paying donors, said Sonu Singh, manager at the Rotary Blood Bank in Delhi. There is also no centralized collection agency. Many people believe that donations deplete the body's blood supply, that vegetarians cannot donate, or that it makes women weak or anemic, Singh said. India also has the lowest percentage of female donors in the world. Only 6% of donors are female, according to the World Health Organization. Facebook talked to hospitals, NGOs and blood banks when designing the new tool. 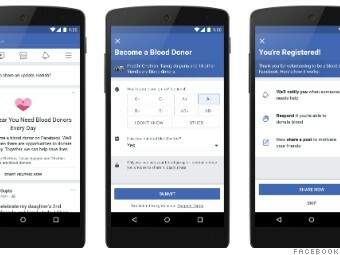 It's only singing up donors to start, but in the coming weeks Facebook will launch a way for groups or individuals seeking blood to send out requests. Donors who are in the right location and have the correct blood group will receive a notification. Beyond matching donors, the tool could help spread awareness about the process. "It is very important to [educate] people about it so that we have more voluntary blood donations in our country," Singh said.